Organix Mighty Meals are a new range of pre-prepared meals designed specifically for toddlers aged 1 to 3 years. Lara and I have been putting them to the test, which I think is a pretty strenuous test given how much of a foodie I am (and Lara is becoming). Despite being a foodie, there is a place in my diet and my routine for convenience foods but when it comes to pre-prepared meals, I am definitely a label-checker and would never feed my toddler anything that was made with ingredients that I couldn't (or wouldn't) use myself at home. And it is for exactly that reason that I am impressed with the Organix Mighty Meals. There are no nasties hiding on that nutritional information label. In fact, when I read the lists of ingredients, there is absolutely no reason why I couldn't make exactly the same meals myself. Oh no, I lie, there is a reason... I'm not superhuman and I don't always have time to make all of our meals from scratch, especially on swimming days when I have one hour to get Lara fed, changed and delivered to nursery before I start work in the afternoons. When I first received a sample of each flavour of Mighty Meal in the post I immediately had a look inside the packets. Usually the real contents of a ready meal bear no resemblance to the tasty-looking dishes depicted on the labels but these ones REALLY do look like the pictures! They look good - they look like I could have made them! Below, Lara let me take a picture of her Spinach Falafels in Big Beany Sweet Red Pepper Sauce. Lara's favourite of all the 5 flavours of Organix Might Meals was the Pork Meatballs in Tomatey Chickpea and Sweet Potato Sauce (Lara LOVES chickpeas). She also enjoyed the Lamp Hotpot. On the other hand, Lara has turned her nose up at both of the pasta meals (Creamy Chicken Pasta and Tomatoey Beef Bolognaise) ; I put this down to the disappointment of the pasta itself. Lara normally loves pasta but the nature of a ready meal means that the pasta is overcooked and very soft compared to how she would normally experience pasta. I polished off the Creamy Chicken Pasta for her... and loved it! I found all of the meals to be of a good quality and to be packed full of vegetables and pulses. I found them very easy to cook (heated through in a pan of hot water or blasted for less than a minute in the microwave). I'll admit that they don't taste EXACTLY like the meals would do if I had made them myself because the Mighty Meals have been cooked and prepared at high temperatures to eliminate bacteria (which means they don't need to be refridgerated and have a nice long shelf life) - it does affect the taste. 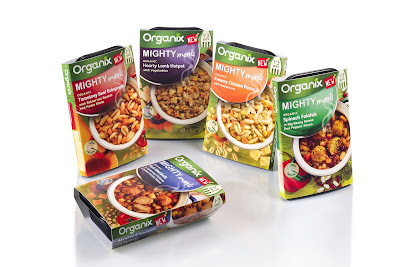 As a foodie mum, I have absolutely no qualms at all feeding the Organix Mighty Meals to my toddler. In fact, I may try and make my own version of the Spinach Falafels in beany sauce some time soon.